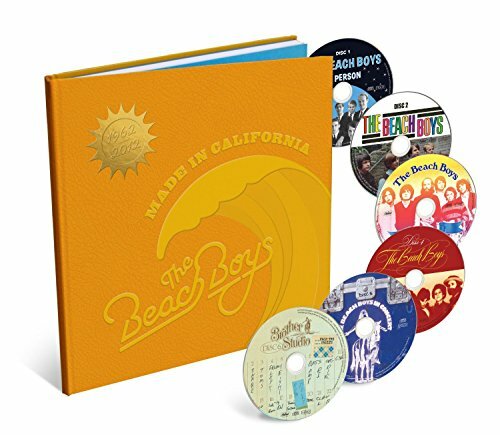 A long overdue boxset hits shelves and digital download spots tomorrow when The Beach Boys’ Made in California drops. Beach Boys leader and lost soul Brian Wilson is aboard for the project, which ships 6 CDs in a high school yearbook format. The package has more than 170 tracks, and 60 of them are unheard rarities, outtakes, demos and live cuts. Made in California showcases the sweep of Wilson’s powerful and unique composition that led The Beach Boys to become the top-selling American band for albums and singles as well as the only American group to have 36 Billboard Top 40 hits. In addition to the music, there is memorabilia for uber-fans, including private photos, a copy of Brian’s 1959 high school essay and comments from Wilson, Mike Love and others–even David Marks! Made in California includes several cuts featuring deceased brothers Dennis and Carl Wilson, including a haunting version of Carl singing Sail On, Sailor in 1995. Speaking with a music fan recently, I was asked if The Beach Boys were a fad, a product of their times or were they really that transcendent. The West Coast surf music they popularized is certainly as rich a part of America’s musical heritage as anything that came out of Motown’s Detroit, blues from Chicago or Muscle Shoals and a thousand variations of pop and rock from all over. The jangly guitars and multi-layered harmonies were certainly some of the defining sounds of the 1960s, but consider those 36 Top 40 hits and ask yourself this question: with so many hits, how come we don’t hear more covers even after 50 years? The answer to that question is your answer to the difficulty and brilliance of The Beach Boys.